Orto di Casa Cecconi: Spring is going to come, after all! Spring is going to come, after all! Today was such a lovely day: it made me forget Christmas and think of spring, besides wanting to go out! It must be the first day we have had a proper blue sky and sun in over a month. I have taken off the decorations from the tree, which has gone back to my back garden. As I put it back, I realised I have quite a few one, two and three-year old hazels and beeches in pots that need a home. The allotment is not in too bad a way, even thought weeds are proliferating and I spent all my time clearing a couple of beds. I am taking out the oldest strawberries from their bed of three years: anyone knows if it is worth breaking down the root clumps and re-plant the buds somewhere else? 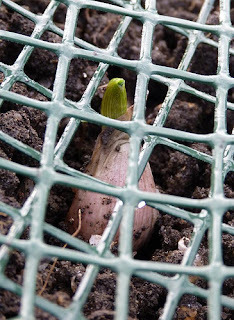 Garlic and onions have been pushing out their little leaf-tops for a while now, but I still have to sow my broadbeans.